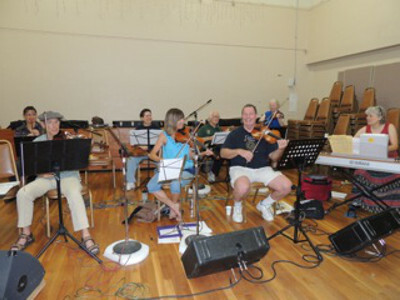 Live music is the essence of contra dance, and in San Diego we are fortunate to have four terrific bands that make it possible to present a contra dance with live music virtually every week of the year: our community band, More the Merrier; Crooked; Figure 8; and Tectonic Shakedown. More the Merrier is our pool of local musicians who love to play music. The Community Band is open to anyone who wants to participate. You should be able to play at least some of the tunes from this playlist. Martha Wild (at the keyboard at far right), leader and coordinator, can answer any and all questions about the band and its music. See the Dance Schedule page for upcoming nights when the Community Band will play. A rehearsal is usually scheduled a week or more in advance. On Friday dance nights, sound setup/check runs from 7 to 7:30 p.m.; the band plays from 8 to 11 p.m. For Saturday dances, sound setup/check runs from 6:30 to 7 p.m., and the band plays from 7:30 to 10:30 p.m. Contact Martha with your email address to be notified of rehearsals and other announcements. Come and play as much or as little as you like. We look forward to seeing and hearing you! Community Band Playlist. In PDF format; revised July 3, 2015. Printable Sheet Music. This is an index that links to more than 90 PDF files that you can download and print for use with the band. Also see the Resources page of this website to obtain additional resources for musicians. 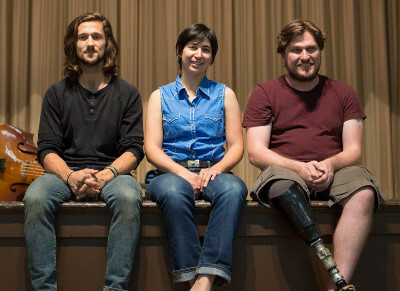 Crooked is a high-energy, San Diego-based contra dance band that every now and then likes to sneak out of the church to get the barflies dancing too. From your left are Nick Montemarano, guitar; Anna Levitt, fiddle and vocals; and Chad Pittman, acoustic bass. Not pictured (yet) is multi-instrumentalist and vocalist Clint Davis. Check out some of their tunes on their website, as well as their Facebook page—and their new music video, Fiddle and the Bow, just below. Figure 8 is a band playing primarily Scottish reels and jigs, with some other Celtic and occasional Old Time influences thrown in. Chris Peoples and Drew Leavens (pictured from your left) have played together for years in the Scottish Fiddlers of Los Angeles, and often play tight harmonies on tunes. Martha Wild and Marci Phelan, once part of the local bands Ranting Banshee and then Flashing Sirens, provide the driving rhythm of the piano and the varied voices of the accordion, respectively, to fill out the musical layers. All together they make a glorious, tight sound to keep the dancers on their toes. Tectonic Shakedown has been playing for contra dances since 2012. You will definitely feel the floor shake when dancing to this string band! 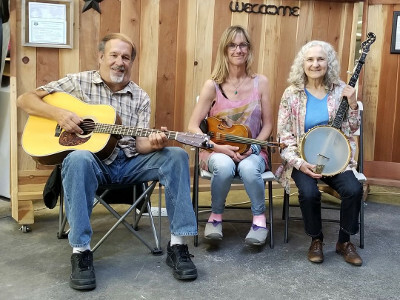 With Kim Spalding on fiddle, Lou Shrinkle on guitar, and JoAnn Koppany on banjo, this band will draw you out to the dance floor with their hard-driving old-timey music. Much of their repertoire is derived from authentic mountain music originating from deep roots in rural Appalachia. They keep the old-time tradition alive by performing tunes as played by many of the great old-time musicians. 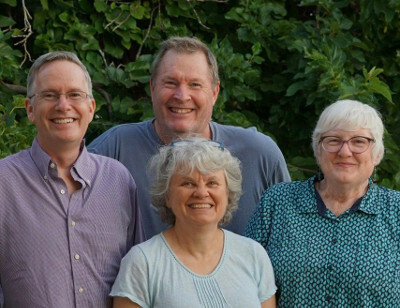 Our San Diego Contra Dance community enjoys having guest bands come into town to impart their own distinctive sound and energy to the contra dance! We usually aim to book two or three guest bands per quarter. Please email our guest talent coordinator, Frannie Marr, and let us know about your interest and availability.